Plaintiff Mary Bevis filed this legal memorandum in response to defendant Massachusetts Port Authority's (Massport) motion for summary judgment. Bevis is claiming negligence on the part of Massport in not providing adequate security measures despite Massport's knowledge of previous failures of security. 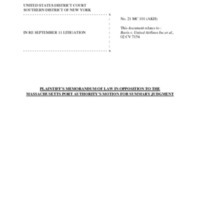 “Plaintiff's Memorandum of Law in Opposition to the Massachusetts Port Authority's Motion for Summary Judgment ,” September 11 Digital Archive, accessed April 25, 2019, http://911digitalarchive.org/items/show/96755.